Have you ever experienced a bout of dizziness when you got up from a seated to a standing position “too quickly”? How about rolling over in bed? Or even lifting your head up from a down position? These are all signs of a bout of vertigo. If you haven’t, then you are one of the lucky few. 70% of Americans will complain about dizziness at some point in their lives, and 20% of 65 year olds have a diagnosed balance disorder. When we use the term “vertigo,” we’re referring to a sense of spinning/movement when everything else remains stationary. Simply put, you have a sensation that the room is spinning, but it’s not. Benign Paroxysmal Positional Vertigo (BPPV) is the most common peripheral vestibular disorder and is prevalent in female patients over the age of 40 with symptoms that are intense but are short in duration (30-60 seconds). In these cases, vertigo episodes are triggered by positional movements including rolling from side to side, lying down in bed, getting out of bed, or even lying in a dentist’s chair–you know–the movements you make every day. In order to better understand vertigo, it’s important to know how your inner ear functions. 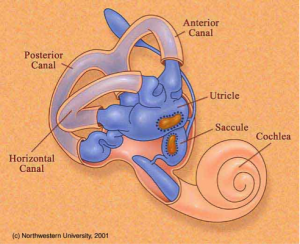 Five structures make up your vestibular system: a utricle, saccule, and three semicircular canals. Within the utricle and saccule, there are hair cells, which are sensitive nerve endings of the vestibular nerve. The vestibular nerve is buried inside a gelatinous mass (sounds gross; it is). On the surface of the hair cells and gelatinous mass or calcium carbonate crystals called otoconia. Otoconia are sometimes referred to as “ear rocks” or “crystals”. BPPV occurs when one of two things happen. Most commonly, the “ear rocks”/otoconia break free from the utricle or saccule and gelatinous mass and become “dislodged” in the semicircular canals. With the crystals in the wrong place, dizziness occurs because the crystals are “rolling.” The dizziness, which usually lasts 30-60 seconds, stops when the otoconia come to “a rest” inside the semicircular canals. The otoconia are “stuck” to the gelatinous mass and weight the mass down when you move your head. This is a more rare form and symptoms usually last greater than 60 seconds and up to 5 to 10 minutes. So what can you do to treat this? Start with your primary care physician. If you’re experiencing the intense 30-60 second episodes or anything longer, you should see your physician as soon as possible. He or she may refer you to an ear, nose, and throat (ENT) specialist, or you may be prescribed medications such as Meclizine, which may actually increase dizziness. Physical therapists are able to detect where the otoconia crystals are and in return perform specific treatments to reposition the crystals back in their correct location, therefore eliminating dizziness spells from occurring! (Usually. Nothing in life is guaranteed). Will physical therapy fix my vertigo issues? Depending on the severity of each case, it may take 1-4/5 treatment sessions to eliminate symptoms, but it’s not a panacea. Your physical therapist may work to reposition the crystals through manual movements on a table turning your head and body in gravity assisted planes of motion in order to position them back to the desired location. They can also work on static and dynamic balance activities including standing on foam, eyes open and closed performing functional tasks as well as other head/eye movement training in order to habituate and retrain your vestibular system to prevent vertigo issues from developing in the future.